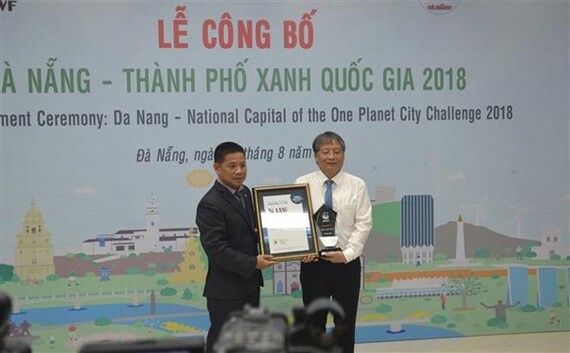 A ceremony was held in Da Nang central city on August 31 to receive the title of National Capital 2018 by the World Wide Fund for Nature (WWF)’s One Planet City Challenge programme. Speaking at the ceremony, Vice Chairman of the municipal People’s Committee Nguyen Ngoc Tuan stressed that the award is a pride of local people and offers chances for the city to promote stronger actions in the building of Da Nang as a green city in the coming time. A total of 132 metropolises from 23 countries entered the One Planet City Challenge programme. 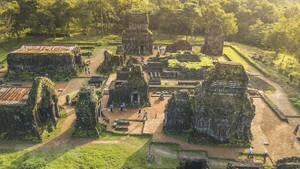 In addition to Da Nang, Dong Ha city (Quang Tri) and Hoi An ancient town (Quang Nam) also qualified for next round of the competition. Da Nang made it onto the list of 21 cities from around the world. The central city had submitted a target of reducing greenhouse gas emissions by 25 percent from 2016, along with plans for solar power development, biofuel use, Bus Rapid Transit (BRT) routes and wastewater treatment. According to a WWF statement, cities generate 70 percent of the world’s carbon emissions, and the WWF’s One Planet City Challenge was a biennial competition that recognised and rewarded cities for developing infrastructure, housing, transport and mobility solutions to power the global transition to a low-carbon, climate-resilient future. It said 50 percent of the global population lived in urban areas, and cities would be home to about 6 billion people by 2050. In 2016, the WWF recognised Hue city as Vietnam’s National Earth Hour Capital 2016 as part of the highly selective global Earth Hour City Challenge.